The use of a draw knife (also known as a draw shave) was universal in an America where one would re-handle tools rather than just throw them out and buy new ones when they broke. These, combined with shaving horses, were necessary tools for any household where some occupant worked with their hands. This photo of Thomas Carroll shows the importance of one company's efforts to manufacture and refurbish these tools which are rarely seen or used today, but were a necessity back when individuals were more self-reliant. The company shop where Mr. Carroll worked as foreman was Mack Tool and Die Company which was located in the "Flats" at the bottom of the Platt Street bridge at water's edge. Brothers William and Royal Mack took over the D.R.Barton Company that advertised that they made "Augers, axes, bits, cooper's tools, edge tools and wooden planes". This isn’t just any lead came knife, this is a national treasure. This knife cut the lead came used in each of the priceless stained glass windows installed by order of then President George H. W. Bush at the chapel he created at Camp David, Md. These windows were created and constructed in Cattaraugus, New York by the world renowned stained glass artist Dr. Rudolph R. Sandon. I first met Dr. Sandon in 1971 and witnessed his artistic creations at his studio numerous times over the years until his passing in 1991. Dr. Sandon demonstrated this knife to me. This knife was used in all of his most recent works and was used in the very special unique windows that I witnessed being created in his studio. The windows at Camp David’s newly constructed chapel were designed to resemble large trees, one for each side of the chapel. Each tree has about an 18” trunk , is very high and very wide. Dr. Sandon’s degree in theology was a priceless asset when he designed and created these windows. The windows that he created are a combination of facet and stained glass. The most significant and cherished feature of the overall design was that no matter what dignitary would visit the chapel from any country in the world, images that their religions could relate to are represented in the branches of at least one of the trees. The symbolism of each member of the human race being interconnected and dependent upon each other is visibly and colorfully radiant in each beautiful window. The design of these windows was very well received. The aura of the thick stone walls and the vibrant glow of the stunning stained glass must be breathtaking, especially in that location. Dr. Sandon asked that I be on the installation team but this was not approved. Curses! Who was Dr. Sandon? Dr. Rudolph R. Sandon was hustled out of Italy at the end of WWII by Wild Bill Donovan, founder of the OSS and CIA. Sandon was not only a sixth generation stained glass artist who had created and repaired windows in dozens of churches throughout Europe as well as the Vatican, but he was also one of Benito Mussolini’s body guards, thus the urgency of his departure from Italy was obvious. I will never forget the photo Rudy showed me of him with Mussolini in front of a massive fireplace. Rudy’s commitment to freedom and humanity was recognized before he left Italy when he was decorated by Gen. Charles De Gaulle for providing misinformation to the Nazis, thereby saving a French valley and villages from destruction. Sandon chose to settle in Painesville, Ohio and early on discovered the skiing in Ellicottville, N.Y. to his liking. Donovan, who was from Buffalo, and Sandon became life-long friends. Sandon and his second wife Helen, constructed, first a cottage, then a permanent home and studio in a secluded area just south of Cattaraugus Village. Dr. Sandon estimated that he had done work for nearly 500 churches in the USA in his career. The last window Dr. Sandon completed was just after the Camp David installation, for Bank of Cattaraugus. As his workmen installed the three windows for the bank, Rudy visited me there to view the windows in place and to say goodbye. He told me that I would never see him again as he was dying of pancreatic cancer. He was gone from this life 10 days later. Dr. Sandon wasn't just a witness to history. He was involved in it. He was a Boy Scout who's Troop was nationalized into a military unit. He was in the Italian Alpine Ski Troops. Dr. Sandon won a gold medal in the 1936 Olympics with the Italian Military Patrol in team biathlon competition at Garmisch-Partenkirchen. He lost a lung in the battle of Stalingrad. He conspired against the Nazis. When in the US he was a lifelong member of the “Company” serving in the Bay of Pigs Invasion of Cuba, and elsewhere. I’m sorry that I can’t relate more stories to you, but then Rudy would want me to kill you. Local Cattaraugus resident Esther Jane Carter displays some of the very large set of cutlery that she donated to our museum. "E.J." was born in Massachusetts near Plymouth in a house that dated to the late 1600's. The donated knives and forks had been either in use or in the attic of the house since at least 1810 according to the 90 year old former home owner who told this to E.J. in 1937. (That is what that lady's Grandmother had told her). Oral history matters!!! E.J. passed away 12/31/15 and was a very much beloved local resident of Cattaraugus and a museum volunteer. We're Gonna Need a Bigger Knife!! Major W. Larry Barr, USAF Ret. 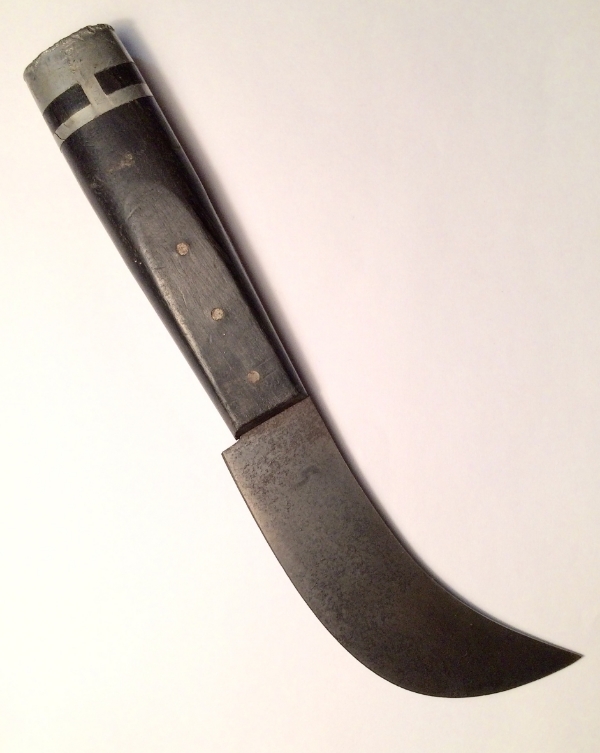 This knife was made by Larry Barr from the leaf spring of his old pickup truck. He made the sheath from the hide of a deer that he harvested and tanned. The lacing is from a woodchuck who didn't need it anymore, and the handle was from an elk antler shed that he found in New Mexico while mule deer hunting. Local resident John D. Merritt, USMC with the Kinfolks knife that his parents purchased at a hardware store and mailed to him. He kept this strapped to his leg in his Grumman Torpedo Bomber Fighter that he flew in out of Bouganville in the Pacific during WW2. Merritt was a gunner in the rear facing gun turret of the TBF. Pappy Boyington was among those who flew cover for his missions in a fighter plane. John wanted the knife handy incase the plane went down so that he could cut himself loose if need be, and swim to safety. John donated this to the museum along with his issue knife and a machete that he also kept handy incase he had to "swim for it" and live for a time on some remote island. John played semi-pro football for the Silver Creek Black Knights prior to WW2.